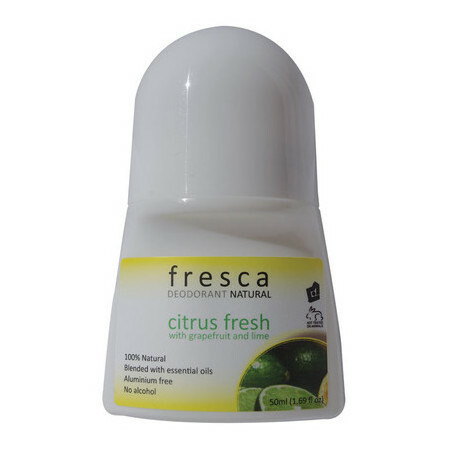 The Fresca Natural Deodorant in Citrus provides an uplifting fragrance of grapefruit, lime and mandarin. These citrus essential oils are known to provide clarity of the mind. This is an award winning hard working aluminium free deodorant made from food grade ingredients blended with essential oils. It works by using a unique suspended formulation of essential oils and natural aerated salt which together creates an environment on the skin in which bacteria cannot thrive and therefore no body odour occurs. This deodorant promotes the body to cool itself naturally without blocking the sweat glands. Made in Australia, 100% Natural, Certified Cruelty Free, Palm Oil Free and Vegan. Due to the essential oil blends used in the other Fresca deodorants, this Citrus fragrance is the only one in the range recommended for pregnant women. Chamomile, Geranium, Grapefruit, Mandarin, Neroli Essential Oil. Purified water, aerated salt (saleratus), vegetable gum, essential oils of grapefruit peel, lime fruit peel, tangerine, mandarin, neroli, verbena, chamomile and geranium. *Contains no emmenogogue oils and is suitable for pregnancy. Roll onto clean, dry armpits. Re-apply as necessary. 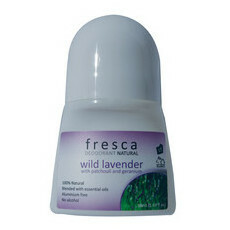 Great roll on alternative to natural deodorant. Does make your armpits wet though so have to watch out when putting on clothes. Using it through pregnancy for gentle ingredients. Bit in the expensive side but I think it’s worth it. I like the smell but found that it didn't last all day especially on a hot Sydney day. I am a very slight person who doesn't sweat much so I was disappointed. I think No Pong is much more effective but I was keen to find a roll on.